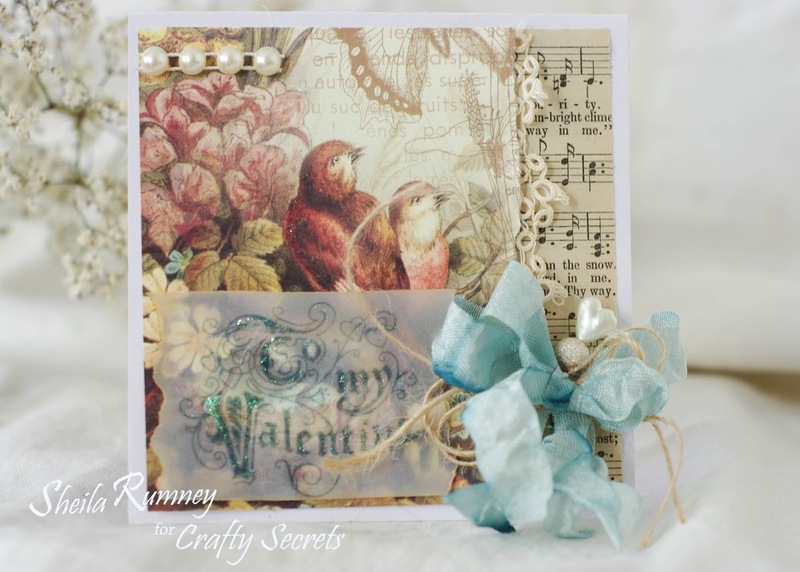 Welcome to the Crafty Secrets February Linky Party. This month we're throwing a virtual Valentine Party and you are invited along as our guests of honor! Create some cute Valentines for friends or family, create a romantic layout, or make "off the page projects" for home decor. Incorporate muse or words to a song somewhere in your project. (Songbirds would work here, too!) You do not need to follow this theme to play along, but it's always fun if you do. Today, I am sharing a sweet little card and how to match a color from an image and color a digital stamp. I used one of my favorite Birds and Blossoms Digital Download and the Be My Valentine Digital Art Stamps. Open your file to be used and a new artwork file. Making sure to put in the dimensions and resolution. Select the Color Picker Tool and mouse of the desired color. Once you do that the color in the boxes in the lower left hand corner will change. Next drag and drop the digital stamp onto your new artwork file. By selected the Edit Tab and Fill layer it will bring up a color box to choose your color. Then choose your color. Clicking OK to apply. Once you have achieved the color desired, save the file and print. I printed mine on velum so you could see the beautiful images beneath. Now it's your turn! Visit each of the design team blogs listed below. Then create a NEW project of your choice featuring ANY Crafty Secrets product and link it up to the Crafty Secrets blog no later than 11:59 PT, Sunday, February 15th. You do not need to follow this month's theme to play along. If you do not have any Crafty Secrets goodies, check the FREE DOWNLOADS located in the sidebar of the Crafty Secrets Blog. Be sure to link to the Crafty Secrets Blog in your post and let us know that Crafty Secrets product you are using in your project. One lucky player will be randomly selected to win our fabulous Vintage Valentine Digital Kit. To thank you for playing along, we've included one free digital stamp and paper to get you started. Feel free to use these images or any Crafty Secrets goodies in your creation. Soft, beautiful and love the added glitter, I think glitter and these images are born to work together!! Birds are so romantic...and this card is perfect in every way. That shabby bow gives me goosebumps! Such a beautiful project, Sheila, and another great tutorial, too. Thank you for always doing something wonderful for the Linky party! This is just gorgeous Sheila! As I have said many times in the past ... you are just SO DANG CLEVER!! Thanks for the wonderful tips & tricks! Again ... BEAUTIFUL! I love those birdies! And the sentiment is perfect on the vellum. Fantastic bow as well! Such a pretty Velentine Sheila! That vellum adds just the perfect romantic touch. I'll bet those birdies are just singing their hearts out so happy to be on such a beautiful card. Thanks for a great tutorial Sheila. I love how you printed on the vellum and added the glitter. I've been changing colors of digital images (thanks to you) now I need to go study your transparency tutorials! the pearls, the lace, and the ribbon...oh so beautiful! Thank you again for the great digital tutorial, you are so helpful! As always ... gorgeous work from you Sheila. And your tutorials amazing!Thank you!